Super Bloom civility — this dazzling event attracts huge crowds and big trouble for fragile flowers. Days are growing noticeably longer with Spring’s arrival. Flowers have begun to bloom, and in California, the timing of the winter rains set off massive blooms of poppies and other blossoms. Seeing these blooms from a satellite image is one way to appreciate the size of the spectacle, while getting caught in a massive traffic jam of flower seekers that shuts down an interstate highway is another. Indeed, social media has brought the phrase “Super Bloom” into our lives and captured the attention of people from all walks of life. 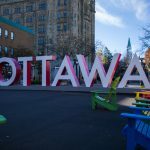 Hundreds of thousands of travelers have descended on locations where the flowers are blooming, and more crowds gather with each beautiful image shared online. Unfortunately, these throngs of flower seekers tend to forget that when they recklessly step into a flowery field, they’re crushing the plants and preventing the vital seed production that brought them there in the first place. 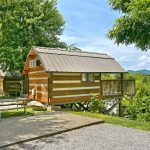 Appreciating nature’s bounty without trampling it in the process — is it possible? 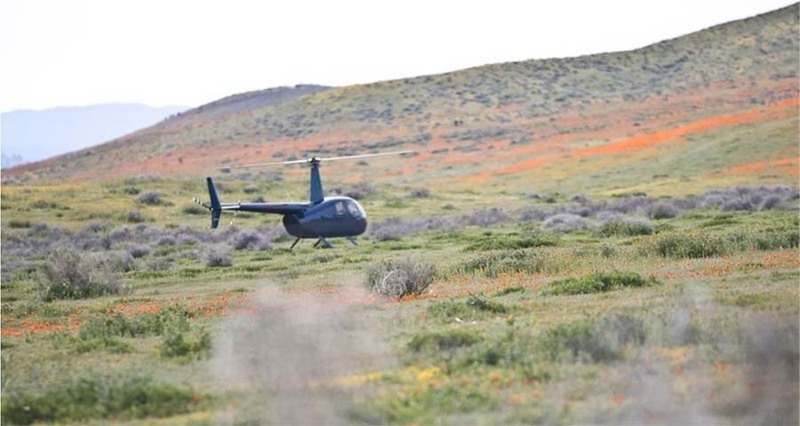 Flower tourists land a helicopter in California’s Antelope Poppy Reserve. Photo courtesy of Antelope Poppy Preserve. For 2019, California put on an amazing flower show, thanks to the perfect timing and quantity of winter rain. And when nature gets it right, we sense beauty and awe, and we find a way to memorialize this experience. Cameras are pressed into use. Pen, ink and or paint trigger coordination of mental and physical muscles in an attempt to render the overwhelming visuals. Souvenir removal of flowers is another way to retain the memory by cutting the plant from its roots and creating a very short-lived bouquet. Wild flowers removed in this way generally are wilted by the time people get back to their cars; the mementos are then discarded on the ground. 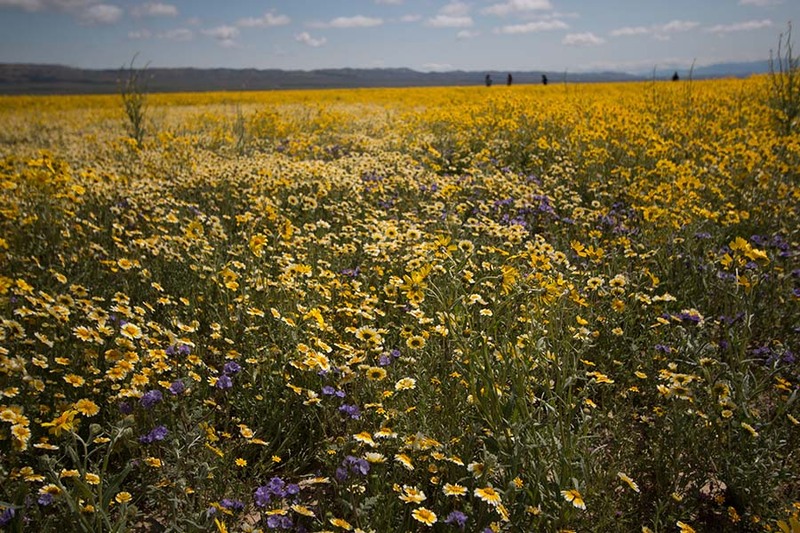 Please note that picking flowers is prohibited in all areas managed by National Park Service, California State Parks and most if not all regional parks. People have interesting reactions when you inquire as to why they have picked the flowers they have in their hands. 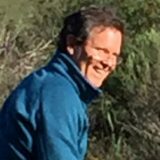 I recently encountered a young couple who were out for a hike along a trail bordered by flowers that seemed to cover the slopes in all shapes and colors. Impulsively the man grabbed a few flowers of different colors and presented them as a gift to his girlfriend. He rationalized this behavior without much thought: there were so many flowers, he explained. He only picked a few, and besides, it was just him picking the flowers, right? I brought up the rules regarding the flowers. Pointing to her boyfriend, the girlfriend immediately piped up and declared that he was the one who picked the flowers. Listening to her throw him under the bus so quickly made me chuckle. Asking why these flowers should not be picked was an attempt to educate without scolding. Success here is never guaranteed. I left wondering if they might get a rash from holding on to those gorgeous phacelias. 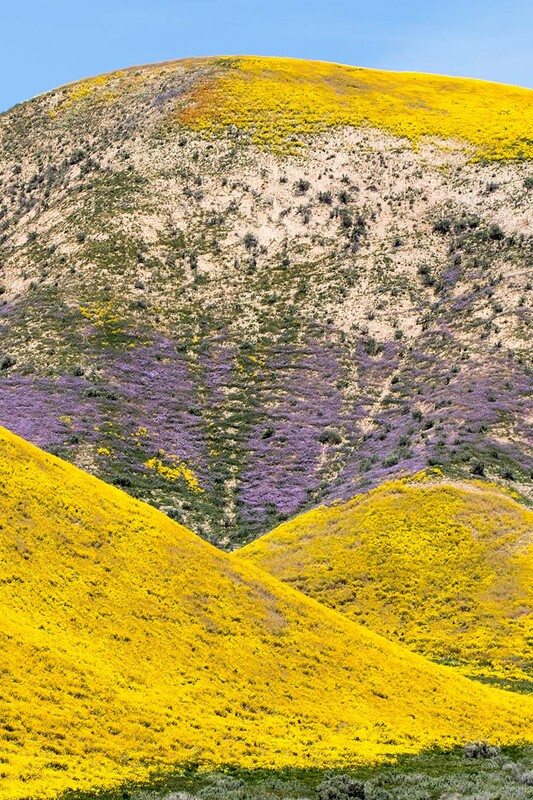 April 2017 was one of the first Super Bloom spectacles in the age of Social Media. 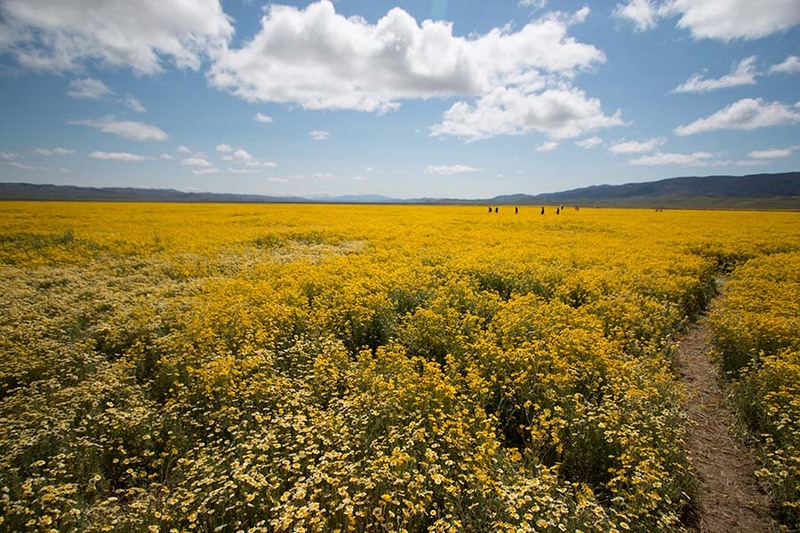 I experienced it firsthand, as reports on TV, the Internet and even at the gas pump on the drive over described the massive numbers of flowers in bloom at Carrizo Plain National Monument, located in Central California between San Luis Obispo and Bakersfield. Thousands of people and parked cars lined road leading through the monument, which contained billions of flowers in colorful bloom. With every parking space filled, many drivers eyed spots in the road and shoulder. 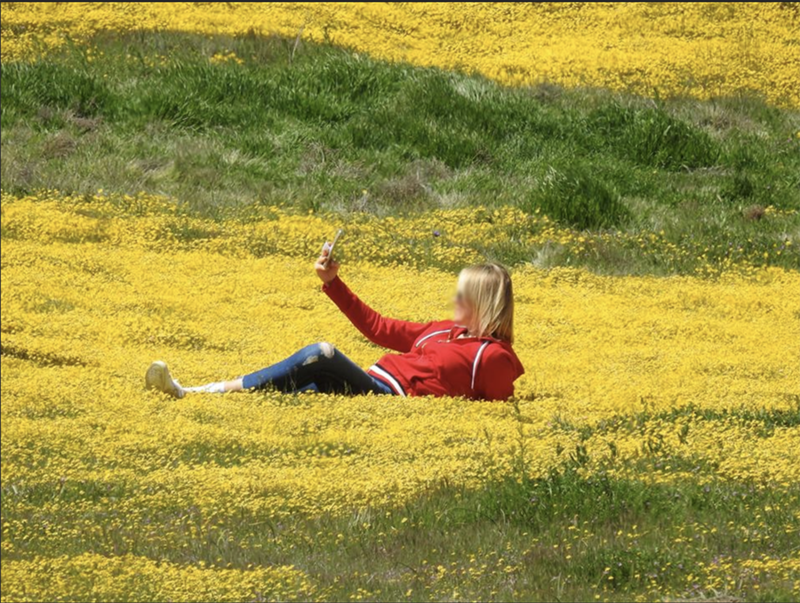 As crowds ambled into the meadows, it became clear that for many, crushing a few thousand flowers was so worth it to many folks to get that awesome selfie. With each passing, blooming day, many had to go further and further into the flowers to get a picture away from everyone else. Rationalization worked to dismiss the guilt people might have felt for the trampled flowers. Everyone else was doing this — so what is one more person doing it? These anecdotes should come as no surprise. The tramplers and flower pickers are not likely to return or experience consequences for their actions. In the presence of all this beauty, large crowds will simply love the flowers to death where they can walk or drive. Going early in the morning or visiting on a weekday is often the best way to view flowers without the crushing humanity that occurs after 11:30 a.m. Visit areas that are farther from the car (a 10-minute walk from the road on a path will limit the size of most crowds). Always remember that picking or trampling flowers kills them and prevents them from producing seeds that will be the basis for future super blooms of even more flowers.